Governor of the State of Maryland, to Sharon Murphy, Greetings: Be it known that on behalf of the citizens of this State, in recognition of a grateful tribute to honor you for your commitment and leadership as Director of Charlotte Hall Veterans Home, with more than three decades of devoted service to our veterans – exemplifying the highest standards of customer services; and as our citizens join in expressing our admiration, great respect and gratitude for your contributions to our state and nation, we are pleased to confer upon you this Governor’s Citation Given Under my Hand and the Great Seal of the State of Maryland the 12th day of March Two Thousand and eighteen. We here at MDVA are very proud of Sharon and congratulate her on this honor. From left to right: MDVA Secretary George Owings, Lt. 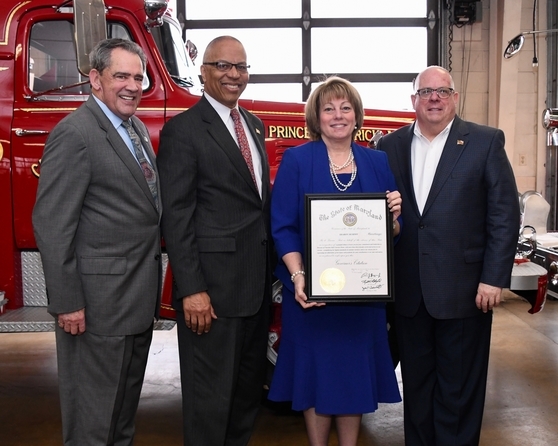 Governor Boyd Rutherford, Sharon Murphy, Director of Charlotte Hall Veterans Home and Governor Larry Hogan. 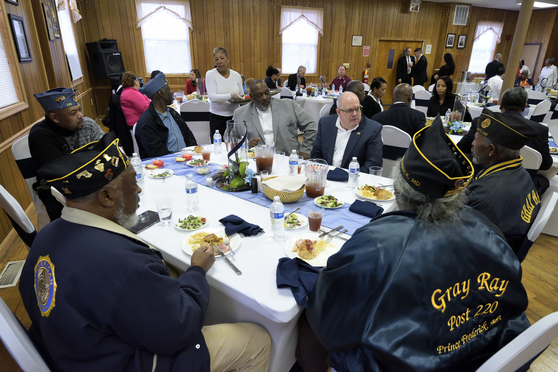 Following the southern Maryland Cabinet meeting, Governor Hogan enjoyed lunch at American Legion Gray Ray Post 220. While there, Governor Hogan pinned Vietnam Veterans and Vietnam Era Veterans with the Vietnam Veteran Lapel Pin. Recently the American Legion Post in Greenbelt was the site for a banquet honoring the National American Legion Auxiliary (ALA) President, Ms. Diana Duschek. 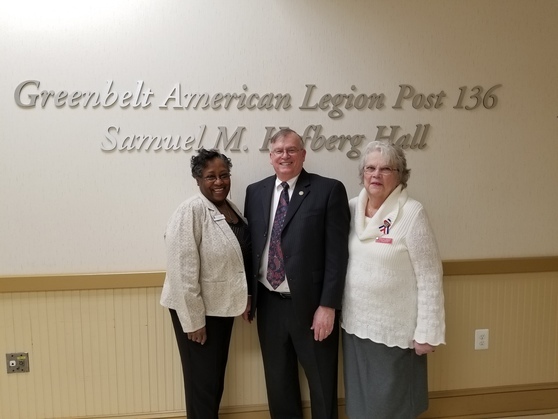 Shown in the photo above are Ms. Joyce Brown, ALA Past State President, MDVA Deputy Secretary Bob Finn and Ms. Anselma Obremski, AKA Past State President. ​The Maryland Higher Education Commission (MHEC) serves as the official State Approving Agency (or SAA), an approving authority for the U. S. Department of Veterans. The SAA has approved and supervises over 400 postsecondary institutions that are legally operating in Maryland, including public and private colleges, universities, community colleges, training academies, high schools and private career schools. Check out new information and new video at MHEC website. During the week of April 16th plan ahead for health care decisions related to end of life care and medical decision-making whenever patients are unable to speak for themselves. Advance directives and living wills can help communicate these important healthcare decisions. Inspired by Governor Larry Hogan’s Regulatory Reform Commission recommendations, the Maryland State Department of Assessments and Taxation (SDAT) today unveiled Maryland Business Express, a new website that will make it easier for Maryland’s small business owners and entrepreneurs to plan, start, manage, and grow their business. 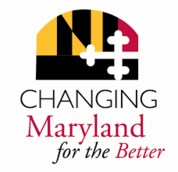 Accessible at businessexpress.maryland.gov, the new site combines information previously spread across many state agencies into one, easy-to-navigate site, while also providing a clear outline of the steps involved in starting a business. A Veteran Resource Fair will be combined with the popular Lattes with Lambs event. Veterans are invited to bring their families, enjoy the day at the park and visit Veteran resource providers. The Maryland Department of Veterans Affairs does not endorse the organizations sponsoring these events, and we do not endorse the views they express or the products/services they offer. The views and opinions expressed in any referenced document do not necessarily state or reflect those of MDVA. The information provided is intended for your general knowledge only, and serves solely as a MDVA community outreach effort.